100 bands minimum. No setup/mold fees! BANDS ARE IN STOCK AND READY TO SHIP! To show support for Boston we are offering these special wristbands for a limited time. 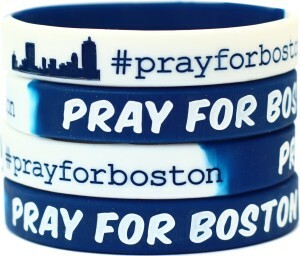 Order these blue and white bands in any quantity below and show your support. You are welcome to use as gifts, for fundraisers, and of course to raise awareness and show you care. We have them in stock and they are ready to ship immediately. They feature debossed color filled text and have a silhouette of the city too. The PRAY FOR BOSTON message wraps around the entire band. Order securely online using PayPal or Google Checkout buttons below. Choose the quantity from the drop down menu and click on "Buy Now" to purchase. Express shipping IS available. Click on the EXPRESS MAIL logo below (before you checkout) to upgrade to Express shipping. Express Mail shipping is overnight to most US locations. You can check to see if it is overnight or 2-day shipping to your location by clicking HERE and using an origin zip code of 95817.